Go DJ, that’s my DJ. The Colorado Rockies defeated the Arizona Diamondbacks in walk-off fashion Wednesday night, 5-4, thanks to a huge home run by DJ LeMahieu. The Diamondbacks scored the first run of the ballgame in the second inning. 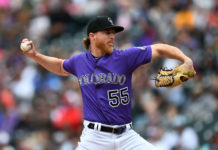 Rockies’ starting pitcher Jon Gray allowed a leadoff single to Paul Goldschmidt which was followed by a walk to Daniel Descalso. Later in the inning, Nick Ahmed hit a sacrifice fly to center field to give Arizona a 1-0 lead. Arizona added an additional run in the third inning when Eduardo Escobar hit a two-run home run to right center field, extending the Diamondbacks’ lead to 3-0. The Rockies were able to get back into the game in the bottom half of the third inning. Gray helped his own cause by starting the inning with a double. DJ LeMahieu later reached base on an infield single. Nolan Arenado then hit a double to left field, scoring Gray. LeMahieu scored later in the inning on a wild pitch from Patrick Corbin, making the score 3-2. Gray was unable to preserve the score as he surrendered a solo home run to Alex Avila in the top half of the fourth inning which would be his last. Gray yet again struggled throughout the evening and departed with a line of four innings pitched, allowing four runs on six hits while walking two batters and striking out six. 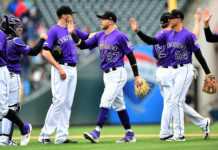 The Rockies managed to pull within one run of Arizona in the fifth inning following a solo home run to center field from Arenado to make the score 4-3. Colorado’s offense was unable to muster up anything in the middle innings and failed to score with runners in scoring position in the bottom half of the eighth. The Rockies’ offense posted double-digit hits ahead of the ninth inning, yet only scored three runs to that point. After Wade Davis worked a clean top of the ninth inning, Rockies manager Bud Black opted to start the bottom half of the inning by utilizing Gerardo Parra as a pinch hitter. Parra hit a single on the first pitch he saw and then advanced to second base on a sacrifice bunt from Charlie Blackmon. 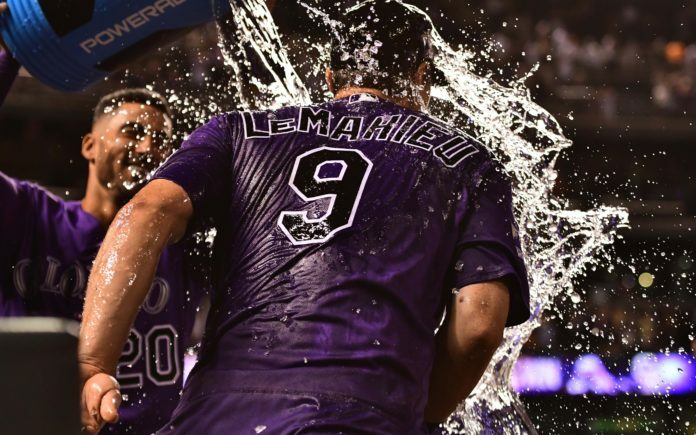 After the grind the Rockies offense had endured throughout the evening, LeMahieu took matters into his own hands with a chance to win the game and delivered by blasting a 1-1 fastball over the fence in right field for a walk-off two-run home run. The walk-off was the eighth of the season for the Rockies, the fifth via a home run. 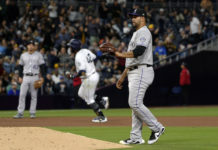 The victory bumped the Rockies record up to 80-65 on the season and maintains their 1.5 games lead over the Los Angeles Dodgers for first place in the National League West. The Rockies and Diamondbacks will conclude their series Thursday afternoon with first pitch set for 1:10 MST.